Click the buy button above to complete the ordering process, then upload a photo of child. 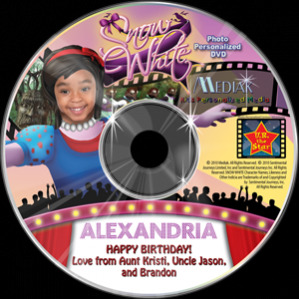 This personalized DVD features your child as the wholesome “Snow White”. Explore the realms of the forest, befriend woodland creatures, escape the wicked queen’s evil spell attempts, and sustain the “fairest in the land”. This Mediak photo personalized video has fairytale’s modern twist, provides endless adventure. This personalized video encourages friendship, benevolence and innocent fun.